If you follow me on Twitter (which you totally should do because I'll be holding a giveaway soon! ), you've probably seen my tweets about me wanting to try out yoga. Tweet, tweet, tweet -- that goes on for about a few more tweets that slip up every now and then. Being someone passionate about living an active lifestyle (read: this, this, this and this), reading about Yoga For Life immediately caught my attention. Not only because I'm very interested in yoga, but this is actually for a good cause! If you think happiness is all about just having the bet things in life come to you, then you're probably the type who gets stressed out whenever something doesn't go according to plan. You know what this means -- stuff like, missing the train or the bus during rush hour, spilling coffee on your new shirt, getting a flat tire during a long road trip. Or maybe, something as serious as finding out your best friend is HIV-positive. Or maybe, even you. Whatever problems you have for the moment, cheer up -- Yoga For Life, the first ever community-based yoga class series designed for people affected by HIV in different ways, wants you to take on a personal mission to live a happy, well-rounded life. The yogis and yoginis from Yoga For Life encourage you to begin your own advocacy to live with a positive outlook, and sharing that positivism to the world—which you can start by helping others use love and happiness against HIV. “We at Yoga For Life wish to challenge everyone to imbibe the spirit of living positively and living well in our newest awareness campaign,” says Charmaine Cu-Unjieng, Yoga For Life co-founder. Through Yoga For Life’s “Living Positively + Living Well” movement, individuals from all walks of life are called to add their voice to the growing number of advocates rallying for positivism and uniting against HIV. To do this, the group will be conducting a two-part open photoshoot on October 22 and 29 at the Pioneer Studios, Mandaluyong City to capture each individual’s story and advocacy. The photos and stories shared in this event will be featured in a photo exhibition, to coincide with the Pride March in December. Participants in the open photoshoot will get their professionally-shot portraits by photographer Noel Abelardo, and a special Yoga for Life “Living Positively + Living Well” shirt. During the event, specially-trained peer counselors from The Love Yourself Project (TLYP) will offer free counseling as well. Proceeds to the event will be used for further skills training of YFL members, as the group expands its program to reach more people affected by HIV. “With this movement, we want to inspire people everywhere to live and spread a positive, healthy outlook in life—whatever circumstances they are in,” ends Yoga for Life co-founder Paulo Leonido. To participate in Yoga For Life’s “Living Positively + Living Well” movement, or for any inquiries regarding the event, contact Charmaine Cu-Unjieng at 0917.5404247, or Paulo Leonido at 0917.3889658. You may also post your queries at their facebook page, facebook.com/yogaforlife.ph. 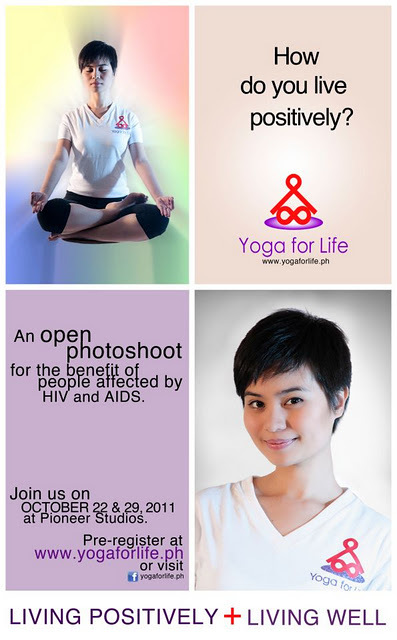 Visit www.yogaforlife.ph for more information. I joined this, too. :) Let me know about this weekend when you can. Nice and very interesting post, thanks for sharing!